A U.S. nuclear arms site in Tennessee could be working its guard dogs to exhaustion during vehicle checks and skipping steps in their training, raising the risk that intruders or explosives could slip into the facility unnoticed, the Energy Department inspector general said in a recent report. "We found that half of the canine teams we observed failed explosive detection tests, many canines failed to respond to at least one of the handler's commands, and that canines did not receive all required training," says the assessment by Energy Department auditors made public Thursday. The department backed calls in the report to settle on and implement "acceptable" work requirements for the dogs, and to develop training certification practices up to par with those of a state or federal police canine program. The Y-12 National Security Complex receives guard dog services under a five-year contract worth nearly $15 million, the report indicates. 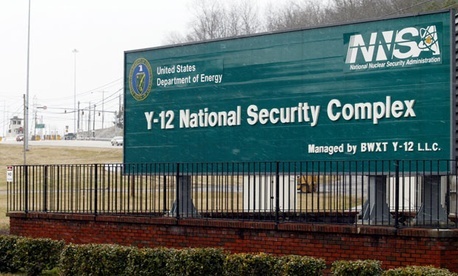 Y-12 has faced a number of security failures over the past year, including a July break-in in which three peace activitists reached the site's bomb-grade uranium storage area and allegations of cheating on exams by contract security personnel. The troubles led the Energy Department's semi-independent National Nuclear Security Administration to dismiss the security contractor at the installation; a new management firm is also being put into place. Auditors said they had been unable to confirm claims that the guard dog company had "rigged" canine proficiency tests, possibly by ordering animals to "sit" when they failed to do so on their own to signal detection of simulated contraband. Worries over lax training prompted the Y-12 facility's operator to place the canine security program on hold for several days last August while an outside group tested the ability of on-site dogs to sniff out explosives. In that test, 14 of the site's 35 canine groups failed to detect one or two of the 10 "explosive testing aids" used in the exam. Despite "immediate corrective actions" by Energy personnel, further action is warranted in part to ensure dogs "are appropriately evaluated, supporting documentation is comprehensive and that the canine teams are evaluated on all 12 types of explosive aids" required under contract, the report states. Separately, investigators said they had confirmed grounds for concern that dogs were being overworked. A number of handlers said managers had refused their requests to grant the animals additional rest time, including during periods of "record-breaking heat," and auditors reported 91 cases in which operators worked their dogs beyond established limits. The canine contractor's internal rules require handling personnel to consult with managers about giving dogs rest time if they perform more than 25 vehicle checks in one hour and their workload does not drop in the following half-hour. The IG report, though, notes a dog team last May had completed 60 vehicle checks in one hour and 42 the following hour. "The skills and proficiency of the canine detection teams could be impacted if the team is required to conduct excessive vehicle searches, thereby potentially compromising the security posture at the department's Y-12 site," the report warns. The guard dog firm said those checks included vehicle "screenings" less intensive than full "searches," but auditors said the company's own guidance establishes no such distinction. Federal and contractor personnel said they had not reviewed canine training and certification records because the Energy Department did not identify canine operations as a "high-risk security area." The National Nuclear Security Administration contested an IG finding that such security risk assessments could be problematic. The assessment does not specifically identify the firm involved, but the Knoxville News Sentinelnamed the firm K-9 SOS as a longtime guard dog handler at Y-12.